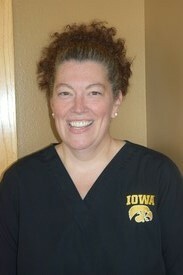 Pam graduated from Hawkeye Community College as a Certified Dental Assistant. She has over 40 years of experience in the dental field as a former dental assistant and extensive background with dental benefits, practice management and accounting. She enjoys helping patients reach their dental health goals by assisting them with treatment follow-through and by working with their dental benefits plans. She enjoys walking, designing quilts and spending time with her 6 grandchildren, Pam and her husband, Gary, enjoy spending time on their Harley trike ...but only when it's nice out! They have three grown sons who live in Cedar Rapids and Dallas, TX. Anna graduated from Kirkwood Community College with a degree in Dental Hygiene. She is also a Certified Dental Assistant and has over 20 years of experience in dentistry. 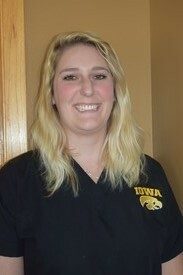 Anna enjoys taking care of patient's oral health and establishing relationships with her patients. She lives in Ainsworth with her husband, Brian and their two daughters, Courtney and Marissa. In her spare time, she loved to be outdoors, camping, following her daughters sporting events and doing home improvement projects. 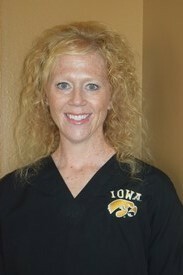 Stacey graduated from the University of Iowa in Botany and York Technical College in Dental Hygiene. 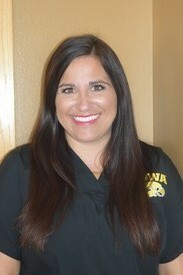 She , also is an adjunct instructor at the University of Iowa College of Dentistry. Stacey is a very thorough dental provider and believes that a person's smile is a huge part of anyone's first impression. She lives in Iowa City with her husband, David, and their children Derek, Gabe and Eden. In her free time she loves to cook, bake, garden and "can" produce and make jellies. Whitney graduated from Minnesota State Mankato University and has a Bachelors Degree in Public Health. She is an Expanded Functions Dental Assistant as well as a Registered Dental Assistant with over 10 years of experience. Whitney enjoys dentistry because she likes to build relationships with her patients. 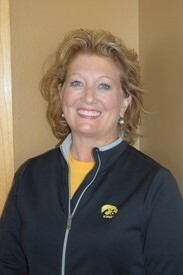 She lives in Iowa City with her husband, Byron, and son, Briggs. In her spare time she loves to travel, spend time with family, attend Iowa Hawkeye Athletic events and being part of the Iowa City West Wrestling program. Ellen graduated from the University of Nebraska with a Bachelors Degree in Psychology. She is an Expanded Functions Dental Assistant and has 5 years experience in dentistry. She is not only a part of our team but also Dr. Molly's youngest daughter. She is applying to dental schools in hopes of following in her mother's footsteps. She lives in Iowa City and splits her time between being a Husker and being a Hawkeye. She and her fiance, Tom, are busy planning their January 2019 wedding. In her free time she loves to read and spend time horseback riding with friends. 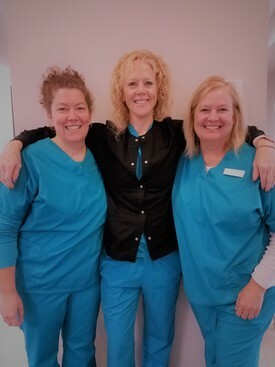 Stacey, Anna and Dawn provide the best care for your return visits.